Whether you are hoping to add character to a new home or looking to add energy efficiency to an older estate, growing beautiful shade-producing trees quickly is a great option for your yard. Trees provide natural shade to help protect yourself and pets from the hot sun. Encouraging the growth of fast-growing shady trees will also help you reduce your energy costs by saving you money through air-conditioning. Growing trees that produce shade coverage is an important step to take in any gardening undertaking. If you’re looking to quickly grow some shade-producing trees, you will want to focus on trees that are easy to care for and will increase in height and width dramatically during a single growing season. Luckily, there are lots of options from which to choose when making this important decision. Not only will many of these trees provide shade coverage and increased energy savings, these fast-growing trees will add beauty, character, and memories for you in your home for years to come. Radiant flowers, incredible growth, and virtually indestructible qualities are attached to this stunning, fast growing tree. The Royal Empress is just what its name implies: a gorgeous tree that is quick to grow, quick to please, and quick to shade a too sunny, overly visible lawn. This is truly the world’s fastest growing tree at up to 18 feet a year! The Royal Empress Tree isn’t picky, either. From California to Rhode Island, Texas to Montana, the Royal Empress grows with ease. These trees are also becoming quite popular for environmental groups as well, since the Empress’ leaves are large (6-16 inches) and absorb pollution and turn it into wood. Then, the Royal Empress releases rejuvenating oxygen to help refresh our own limited supply. With such large leaves, this tree is able to do this extraordinarily quickly and efficiently. In addition to this, the large leaves also increase coverage. Enjoy the cool shade of the Royal Empress, and rest assured that you are helping decrease pollution and your energy bill in the process. With any large, sunny expanse come dried up grass, extra water use, and hot soil and air that increases the heat in your home. Avoid this problem with the Hybrid Poplar. You won’t have to wait for your grandchildren’s generation to enjoy it, either. The Hybrid Poplar is a fast-growing shade tree that can grow up to 8 feet a year. In just a few short years, you will have you very own 40 to 50 foot Hybrid Poplar to block the hot afternoon sun. Don’t fret about your soil or climate. 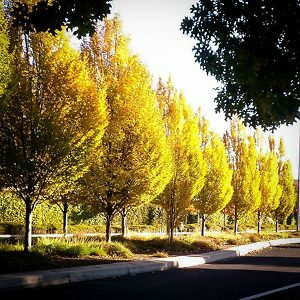 The Hybrid Poplar is drought tolerant and soil adaptable, meaning it can grow almost anywhere in the United States. Let the Hybrid Poplar thrive in your yard, and protect you in its beautiful, cooling shade. You’ve been dreaming of the tire swing hanging from the gorgeous maple or oak in your yard since you were a kid, but now that you have your own treeless lawn the idea of waiting 30 years for a tree to grow simply seems out of the question. The American Maple is here to solve your problems. It is simply beautiful. 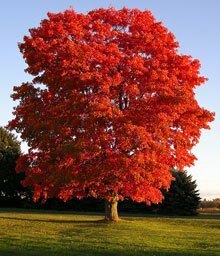 In the fall, your American Maple will shed stunning red leaves to prepare for winter. In the spring, your tree will grow up to 3 feet a year and extend hundreds of strong, sturdy branches. American Maples are adaptable and easy to grow, especially in colder climates. 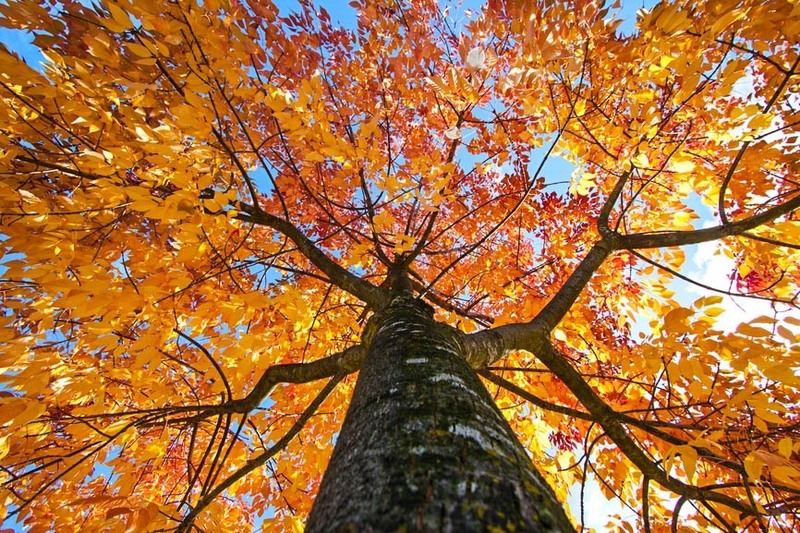 Your mature maple will grow to be between 40 and 60 feet tall and 25 to 45 feet wide. Drought tolerant and sturdy during storms, the American Maple is sure to add stunning character to your yard and provide shade and beauty to your home. The evening sun sets on your Tulip Poplar tree, and you now know where Dr. Seuss came up with his idea for truffula trees. These enchanting golden spring trees add a dose of magical shade to your yard. To add to your spring delight, the Tulip Poplar also displays sunshine yellow flowers that attract all manner of wildlife with their nectar. In the fall, the leaves will turn a warm yellow and brighten your entire neighborhood. In summer, your Tulip Poplar will be a fast-growing, shade-producing tree that makes your yard shimmer with delight. 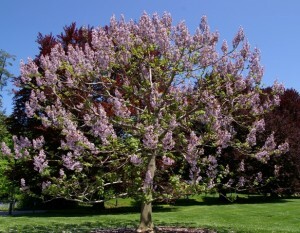 This majestic tree is easy to grow, especially because it is resistant to disease and pests. 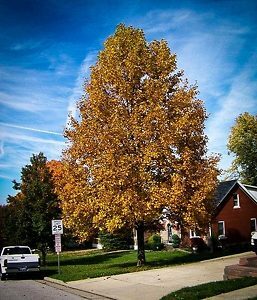 With plenty of space, the Tulip Poplar can grow up to 70 feet tall adding value and beauty to your home. In addition to this, this poplar will also provide shade for the full warm season helping to lower your bills. Don’t worry about where you live; the Tulip Poplar will grow easily and gorgeously throughout the United States. Weeping Willows are not pensive, though the name implies differently. In fact, the stunning beauty of the Weeping Willow will bring you tears of joy in helping you build memories, stories, and shade for you and your family in years to come. A Weeping Willow provides a soft loveliness to a yard that will be the envy of your neighbors. Graceful and meditative, the Weeping Willow bends its gentle boughs outward, covering large expanses of land. The smaller branches then sweep the ground, gracefully swaying in the light summer breeze. Willows are fast-growing in general, but the Weeping Willow will grow up to 8 feet a year. You will quickly have a growing canopy that stretches to enshroud you and your family in splendid shade. Imagine a table set up underneath the Weeping Willow’s sweeping branches, set with a mismatch of linens and dishes. The outdoor picnic with your willow providing you shade, security, and stunning beauty will be one of hundreds of memories to form with this unique tree. A favorite for tree enthusiasts and horticulturists, the Weeping Willow is easy to grow in a variety of soils. 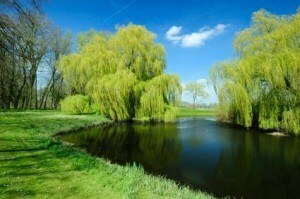 Although the Willow prefers the banks of rivers and streams where it can help prevent erosion, it is a fantastic edition to any field or yard.